"But then one day, a moving truck arrives next door. I look out my window, and I see him. He's tall, lean and wearing all black - black T-shirt, black jeans, black sneakers, and a black knit cap that covers his hair completely. He catches me looking and stares at me. I stare right back. His name is Olly. "Maybe we can't predict the future, but we can predict some things. For example, I am certainly going to fall in love with Olly. It's almost certainly going to be a disaster." For a while now, I've heard of the hype bubbling around this book. I ignored most of it because if past experiences is anything to go by, hype in no way translate to a good book. 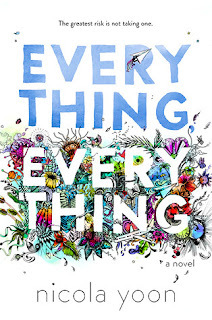 Yet despite my lack of notice regarding the growing enthusiasm in the online book community about Nicola Yoon's debut novel, some form of recognition was triggered when I stumbled across this book because I picked it up by chance and gave the synopsis a quick peruse. The first thing I would like to comment on is the cover. It is simple, beautiful and an accurate depiction of the novel all at the same time. Madeline Whittier is a girl with severe combined immunodeficiency, otherwise known as SCID. All her life, all she's ever known is her mother, her nurse Carla and the interiors of her house, which is specifically designed to keep everything about the outside world out. She knows she is missing out on "normalcy" but she is okay with it - it is the only thing she's ever known and she has had a long time to accept her fate. Until one day, a new family moves in next door. There is something about their teenage son, Olly, that intrigues Madeline from the first time they locked their eyes on each other. But their path to friendship and beyond will not be smooth. Join them as they both deal with their own obstacles in this crazy journey we call life. Another strong element of this novel is the character development. The reader can envisage the slow changes that Madeline undergoes as she gets to know Olly better. There are shifts in Madeline's thoughts as well as changes in her relationships with her mother and Carla. With Madeline's growth as a character, there is a real sense of passage of time without any obvious comment about how many weeks or months have passed. The setting is also something I would like to commend. Nicole Yoon really did think of everything when she set Madeline down in a house designed to be as pathogen-free as humanly possible. Everything is amazingly detailed that the reader can actually picture living inside such an abode. So with all these excellent things about this book, why did I give this book such a seemingly low rating? To be honest, I had a really hard time settling on a rating for this book because while there are so many things I enjoyed about this book, I couldn't really force myself to elevate this book to a 4. Maybe a 3.5? But then I think I'm just forcing myself to deliberately be gentle with this book. So in the end, I settled for a 3. But a really really good 3. 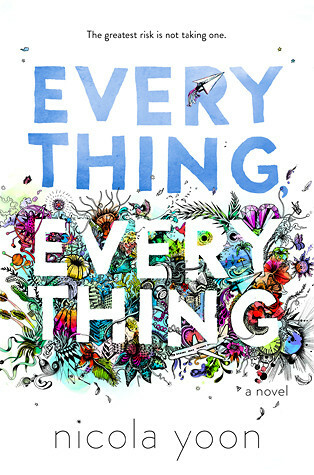 Not a "maybe" recommendation, but a strong recommendation for everyone who likes contemporary YA-fiction to give this book a go and see if you get a different response to it than mine. Ultimately, it came down to the plot. Without spoiling anything for anyone, all I will say is you will know what I'm talking about when you read it. Not sure if it's my medical background or just my general reading preferences which strongly rebels against a simple solution to a complex problem, but the plot is something that just didn't sit right with me. For the most part, the plot is enjoyable and funny and reminiscent of many other excellent works in this genre (but in no way similar or imitative of them), but ultimately, I just couldn't fall in love with this book. Overall, it was an enjoyable and fast-paced read. There are so many things I loved about this book and for a debut novel, the writing, character development and world building is of very high quality. Ultimately, I didn't enjoy where the story took us but given its strong points and the fact many other readers loved this book, I would highly recommend YA readers to give this book a go and see for themselves.